World-class operational efficiency, scheduling flexibility and experienced staff enable Mission Valley Electric to respond effectively to your electrical needs, whether you require a one-hour service call or a multi-phase design/build project. Mission Valley Electric was founded on two basic principles of integrity and quality. As a full-service company, we offer expertise in electrical design, construction and service. 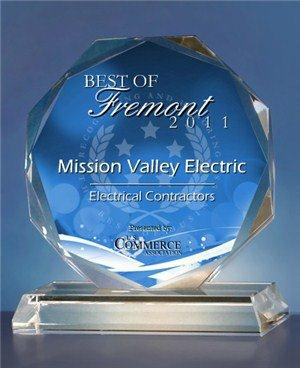 Mission Valley Electric has been selected for the 2011 Best of Fremont Award in the Electrical Contractors category by the U.S. Commerce Association (USCA). Read the press release. Residential services include any electrical project in a single-family dwelling, condo, townhome or apartment. We can wire your building to fit your business. We always use three of the best suppliers in the Bay Area to ensure we get the best product at the best price available for your project. We never charge for providing an estimate for your project. We like to visit each project site to discuss the details with the customer. It is not always possible to completely evaluate a project scope with only a phone conversation, and visiting the job site is the best way to gather accurate information.